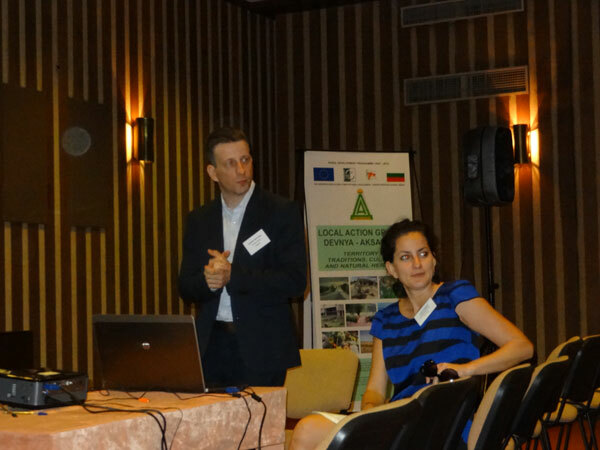 The seminar was initiated by the Bulgarian Managing authority for LEADER. The purse was to exchange experiences regarding the implementation of the LEADER approach during 2007 – 2013, to share ideas for the preparation of Community-led Local Development for 2014 – 2020 programming period and to identify cooperation opportunities. The seminar was hosted by the LAG “Devnia-Aksakovo” which is developing its territory focusing on minimizing environmental effects from the local industry and strengthening local partnerships. For more information about their work please visit here. The event was attended by representatives of the 35 LAGs from Bulgaria, more than 15 Romanian LAGs, LAGs from Italy and also by representatives of the Managing authorities from Bulgaria, France and Hungary, as well as Paying agencies from Bulgaria, Romania and Hungary. The ENRD CP provided an overview of main lessons learnt from LEADER implementation from the EU perspective and information on main planned changes for the 2014-2020 regulatory framework. The Bulgarian Managing authority shared main lessons learnt from preparatory work and the launching of LEADER in the current period as the basis for the changes planned for 2014-2020 which include increase of targeted areas to be supported from LEADER, simplification and optimization of procedures related to funding and decision making. The Bulgarian and Romanian LAGs presented their territories and LAGs as a basis for exploring the potential opportunities for TNC cooperation. The Managing authority and paying agency from Hungary shared how they see the main tasks and challenges from working on LEADER focusing on the importance of intensive communication and a dialogue amongst stakeholders involved in LEADER more than related to other elements of the RDP to ensure that all bodies involved understand the perspectives and the expectations of the others in the delivery system. Participants also had the opportunity to receive information from and ask questions to the French Managing authority on lessons learnt and future plans for LEADER and TNC for 2014-2020. In addition to the above, participants had an opportunity to learn more about the region during a study tour organized by the LAG ‘Devnia – Aksakovo’. They visited the Museum of mosaic and a natural site, both with high potential for valorisation and development based on the historical and natural heritage. The study tour also included visit of the site of the Restaurant Villa Marciana which will be supported from LEADER to enhance their services with offering accommodation. Successful implementation of LEADER depends on the effective interaction between all organizations involved. The application of the LEADER approach is impeded when the administrative procedures are at the centre of all processes and are too complex. The seminar provided opportunity for Bulgarian and Romanian LAGs to present and share results from their work, as well as to identify ideas for further cooperation. Hungary, Romania and Bulgaria will continue to develop their cooperation and intensify exchange of experience inviting France to join where there is a shared interest. The Romanian LAG association committed to identifying possibilities to conduct a follow-up event which will allow for continuing cooperation. Romanian and Bulgarian LAGs identified opportunities and needs for training and study visits exchanges.